There's only one Red Lion!! Welcome to Chiang Mai's favourite pub. 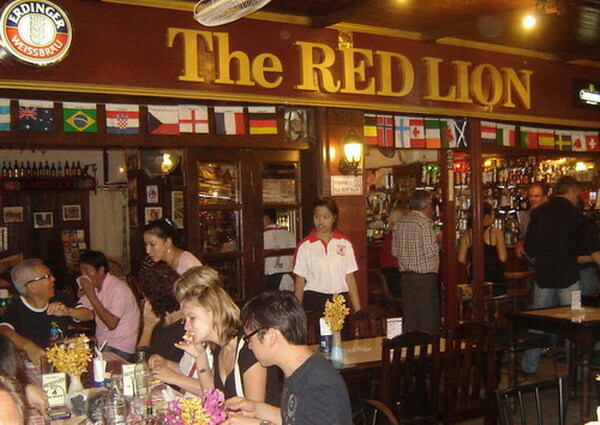 Established in 1997, The Red Lion English pub is one of the oldest pubs in Chiang Mai. In the heart of the famous Night Bazaar, it has become a firm favourite with locals and tourists alike. We have a full International and Thai menu with Meals being served all day from 9.30am until 11.30pm. Our air-conditioned bar and outdoor terrace over-looking the colourful Night bazaar are perfect places to unwind after a busy day touring the mountains and temples or a busy night shopping. Live sports are shown at weekends, including Premier League football, Six Nations Rugby, Formula 1 . The Red Lion is also the official home of the Chiang Mai FC Expats Supporters Club. See "Live Sports" for details. The Red Lion has also become a popular meeting place for the golfers playing at the many great Chiang Mai courses. And if you like football, we can help organise a trip to watch Chiang Mai FC at home in the Thai Premier League.